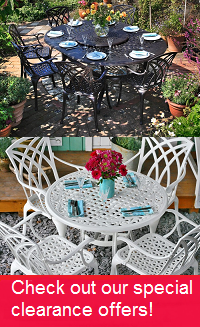 Our cast aluminium furniture is not just for the patio or garden. We offer some wonderful 8 seater metal dining tables that are both functional and stylish. Here you’ll find extendable tables and glass top dining table sets in a variety of colours. The advantage of cast aluminium dining furniture sets is that they’re sturdy and durable while being lighter than solid wood or other metal dining furniture. Browse our high quality 8 seater dining tables and find the perfect table and chairs for your dining room. In this 8 seater range, all our models are rectangular metal dining tables. The Violet table is an 8 seater extendable table with a simple sleek design, available in multiple colours. Extending the table adds a full metre to its length (200cm to 300cm), making it comfortably spacious enough for family get-togethers and dinners with friends. The Virginia table is another extendable metal dining table that can seat up to 8 people. The link will take you to the Virginia table in white and grey, but you can have this superb dining table in all grey, black, and white and champagne too. The Beatrice table is an 8 seater glass top dining table. The glass table top gives the table a really sleek and luxurious look, and is made from durable, toughened glass. Like the other models, it too is an extending table, capable of extending from 180cm to 240cm. The Beatrice table comes in black, grey, white and grey, and white and champagne. All the aforementioned dining tables come as a furniture set, so dining chairs are included. These are also made of cast aluminium, combined with a hard-wearing mesh fabric on the the seat and backrest. They’re also stackable, so when you don’t need the table extended, the extra chairs are easily stacked and stored. Various models of chair can be paired with your choice of table. Generally, the Lea chair is the default option which comes with the furniture set at no extra cost. There’s also the Milly, Georgia and Abigail chairs. If you prefer the look of one of these chairs, you can pair it with your chosen dining table for between £10 and £25 per chair. Depending on the colour of the dining table, your preferred chair model may also come in a choice of colours. Upon request, we can send you fabric and metal samples. These give you an impression of the quality of our materials. They can also help you to choose the colour which best suits your dining room. Get in touch with our customer service team to request samples. We offer free delivery on all our 8 seater dining tables. So there’s no need to worry about additional charges on the checkout page. Our dining furniture sets are delivered as a large package or on a wooden pallet by our partner couriers Parcelforce or Geodis. Both offer online tracking of your order from the day of dispatch. Geodis will also call you the day before delivery to arrange a time slot that works for you. For more details about delivery you can have a look at our delivery information page or give us a call. The friendly Lazy Susan team is on hand to take your calls or answer your emails from 08:00 to 18:00 daily. They can provide more information about our indoor furniture and respond to any other queries you have. Call us on 01243 717107 or email us at [email protected]. We try to answer emails within 2 hours during office hours. Please, show us your new dining furniture and help us raise money for our Do Some Good charity campaign. All you need to do is to take a few pictures and share them on Facebook or Instagram with the tag @LazySusanFurniture or email them to us. We’ll then donate £10 for any set of photos of Lazy Susan furniture in your dining or dining room, or £20 for photos including friends and family during a family lunch or BBQ. Your help goes a long way.